Tripuris are the largest tribal community in Tripura. They have first migrated in this territory and could be introduced as aboriginal tribe of Tripura. Numerically as per 2011 Census they are 5,92,255 persons in the State and highest in number among all the tribal groups. Tripura was under rule of Tripuri kings till it merged with Indian Dominion in the year 1949. Ethnically Tripuris belong to Indo-Mongoloid origin and linguistically within the Tibeto-Burman family. They speak in Kok-Borok dialect like other 7(seven) tribal groups of Tripura. Tripuris are mainly Hindus. They follow both the Shakti Cult and Vaisnavism. Besides they have belief in different deities. Different rites and rituals are traditionally followed by them from time immemorial. Garia, Kharchi, Ker are their main festivals. They have colourful folk dances like, Garia, Lebang, Musak Surmani, Tangbiti and Mamita. These dances are invigorated with sweet melodies of folk songs and music of flute, sarinda, champreng and other string instruments. 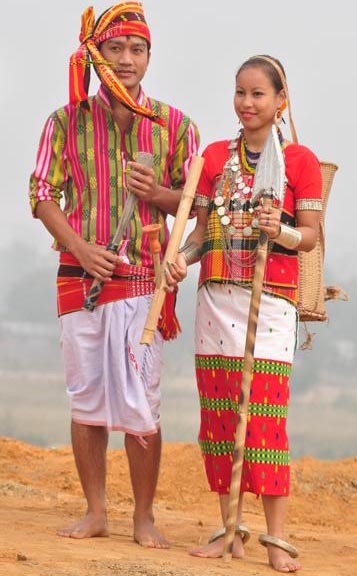 Due to social transitions in all spheres of life particularly in the field of agriculture, socio-culrural life, economic life, educational sector and health awareness, and progress in all walks of life, Tripuris are now treated as an advanced tribal community among the tribes of Tripura.